According to the National Center for Educational Statistics, in 2017, only 4.7 percent of faculty in the U.S. identify as Latinx. Research has shown that having role-models and mentors who share racial/ethnic identities can contribute to an individual’s self-concept of pursuing similar careers. Too often, people from underrepresented racial or ethnic communities hear about the struggles their community faces, rather than their increasing growth and success in this country. As an aspiring faculty member, part of my experience dealing with the Impostor Syndrome or feeling as though I am not able to do this is tied to not having the exposure to “people like me” in the academy. As an undergraduate, I majored in sociology and only had one Latinx professor in my major who taught “Latinos in the U.S.,” a course that went over the different migration patterns of Latinx communities entering the U.S. and the influence they have had in our politics, culture and society overall. I had other Latinx professors as an undergraduate but they were all through courses from the Latino Studies Program. Dr. Hector Velez, was one of my favorite professors at Cornell. An advocate for the community, he was instrumental in the creation of the Latino Studies Program at Cornell. 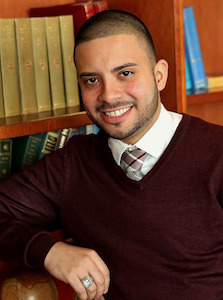 He made it a point in his class to encourage students who identified as Latinx to embrace that identity and tied a lot of the experiences students typically face at Cornell to those faced by Latinx communities during their migration to the U.S. He had a way of talking about Latinx culture that would make Latinx students proud of their heritage and make them want to become more involved with that community in Ithaca, New York. He was a role model I didn’t know I needed at the time, and would become instrumental to my endeavors to get into graduate school years later. As soon as I expressed interest, he would check up on me constantly to make sure I knew I can do it, and to keep me on track of gathering all my materials. In graduate school, I have had only one Latinx professor. He interviewed for the position during my first year as a doctoral student and I was excited about the potential to collaborate with him, but more importantly, to have a mentor that I can relate to in ways that I cannot with other faculty in my department. Dr. Manuel González-Canché, has been helpful in more ways than I could have anticipated. His classes, Social & Statistical Network Analysis and Quasi-experimental Design in Higher Education, are the type of classes I tend to avoid, quantitative courses. However, I enrolled in both of them to develop a working relationship with him and because he assured me that I would be able to succeed despite any concerns I had about my skillset employing these types of methods in research. These courses, expectedly, were the most challenging courses I took. However, I was able to pass because he made himself available and really took the time to make sure that students in the class understood the code required to do our homework, and talk through how the concepts of the class could be applied to research interests the students had. Had I not wanted to connect with him, I would not have pushed myself to take courses like his that covered topics I was unfamiliar with and intimidated by. As a mentor, he has reminded me time and time again that he is a colleague, not a superior. His ethos around “final projects” for his class are research proposals and draft manuscripts to be considered for publications, which made it really easy to collaborate with him and build a lasting relationship as a mentor and colleague. There hasn’t been an instance where I ask him if a certain research interest of mine can be developed using a method he teaches where he has not been able to suggest several ideas on how to make it happen and offer his assistance in writing up the code to investigate these questions. On a personal level, I appreciate his willingness to share and relate to our experiences. Whether it is small-talk outside of his office, receptions at school events or social events outside of campus, he takes the initiative to meet students where they are. It’s natural for individuals to seek out people who share their racial/ethnic identities. While it may seem “self-segregating” to some, I would challenge them to reflect on whether or not they ever had to question their ability or endeavors because of their identity and how having someone you can relate to can help with that. The relationships I’ve developed didn’t necessarily happen because we were all Latino, but it intuitively felt natural for me to approach these individuals for advice. I didn’t feel like I had to “be on” when I met with them. Instead, I was just able to be me.